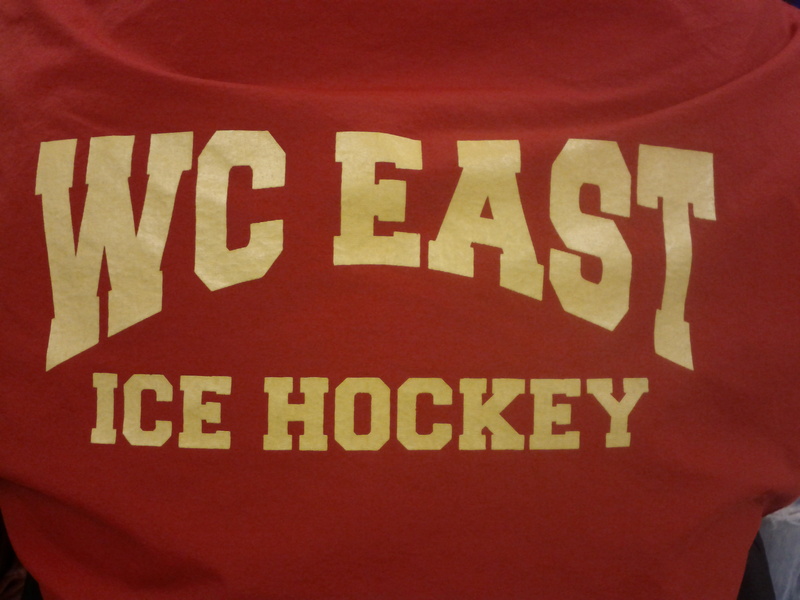 117 The WC East Vikings finished the ice hockey season 16-2-0 and won the Ches-Mont title, which is the local league. They are now on the road to States after winning their first Flyers Cup game 3-2. They are playing tonight! This is one of my first period students, showing off his Vikings gear and dressed for success! EXTRA POST! WE CAME IN THIRD! We had a small group this time, at the third and final meet of the Physics Olympics season. Some of our kids were at Academic Team, some were at an Indoor Track Meet, and some were at an all-day rehearsal for the musical, Hairspray!, which is scheduled for this week Thursday – Saturday. However, we were able to maintain our third place status! This meet had an odd beginning, since less than two weeks ago the senior coach at one of the schools died suddenly. We began with a remembrance of him, and a couple of us said a few words. Then it was a lot of work for my kids, as all of them were involved in most of the events! 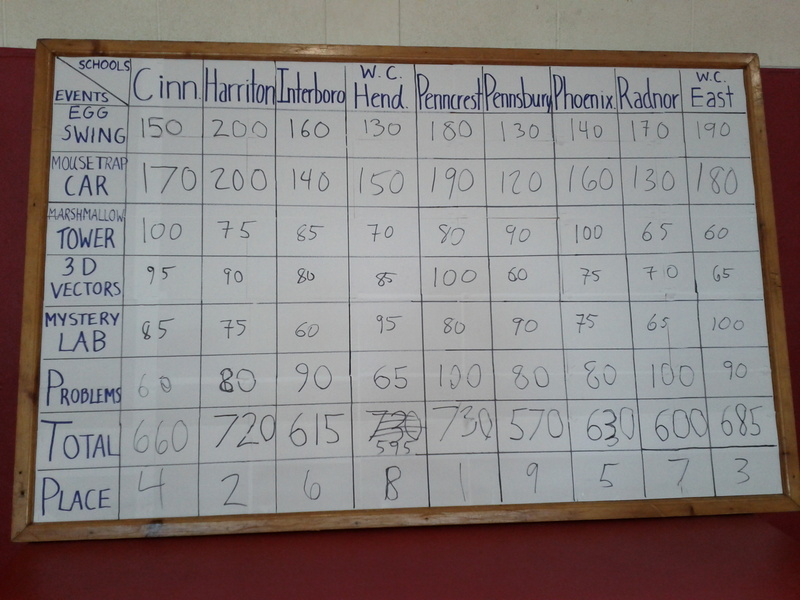 There was an odd ending as well: two teams tied for first place! When there is a tie score, we skip the next place number, so there was no second place team. But two teams tied for third place, too! Our team and the other school from my district that competes, Henderson HS, tied! Of course, Henderson HS is East’s arch-rival! This was the final meet for seniors, of course, including my team captain of the past two years. This is a wonderful moment. Third place is the highest we have ever scored, as the two top teams dominate every meet. Since I have been the coach (this is my 11th year) we have never placed this high! EXTRA! 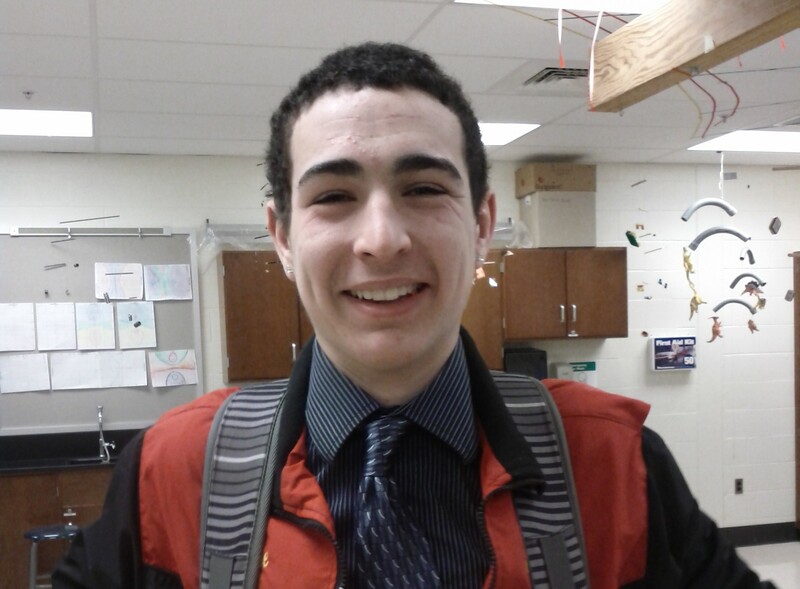 We had our second Physics Olympics meet of the year yesterday. I am proud of this group of kids (and five others, not shown) for placing third in the DC Circuits Mystery Lab event, in which one of the things they had to do was determine the capacitance of a capacitor using the time constant, with a stopwatch and a voltmeter as their tools. We learned that technique less than a week ago, and haven’t gotten to the theory of it in AP Physics yet. Heck, we haven’t started E&M in AP Physics yet. I am also pleased that the problem-solving team solved all their problems correctly, including the one that had to be solved symbolically rather than numerically. But I am also angry at them for ignoring the instruction on significant figures. They had too many sig figs and that brought our score down. We also took third place in the aluminum foil tower event, in which students had to build a tower with a 60-cm piece of foil which would support a ping-pong ball. Tallest tower wins. We got over 1 meter, but I don’t know by how much. Unfortunately, we did not score very high in the build-ahead events, so overall we were in 7th place for the meet (out of 9 schools). But we are still in third place overall for the league to date, so he have hope. In the next meet, there will be an electric vehicle event, the efficient bridge event (we use the IIT rules and our event is the local qualifier for their contest), and the physics relay! The relay involves both athletic requirements and problem-solving, and is quite a challenge. My school used to dominate the relay, since I had athletes in my Physics 2 class. I’m hoping we can re-establish our awesomeness this year with the relay. 61 Tomorrow is our second Physics Olympics meet of the year. Students were practicing “straw arm” in which they have 25 McDonalds straws and some pins and they have to build a cantilever out from a table to support a 100-gram mass. This is another arty photo on my nice black lab table. I debated putting this post up, but I decided that if I am truly documenting my year I should include some of the extra time I put in. So last Saturday, I (and my colleague) spent 7:30 AM to 12:30 PM chaperoning 19 students at a Physics Olympics meet at a nearby high school. For weeks we’ve been taking turns staying after school with the kids as they prepared for the meet, and Saturday was the first of our three competitions (the next is in December, and the last will be in February). In addition to chaperoning, I ran one of the events (the coaches at the various schools take turns writing the rules for and running the various events). I was thrilled that our team came in 3rd overall at this meet, considering that we usually hover in the 7th to 9th place range. I hope my team can maintain its current advantage and it would be awesome if we could make it to first or second place! The teams currently in 1st and 2nd place dominate the competition, and will be hard to beat. 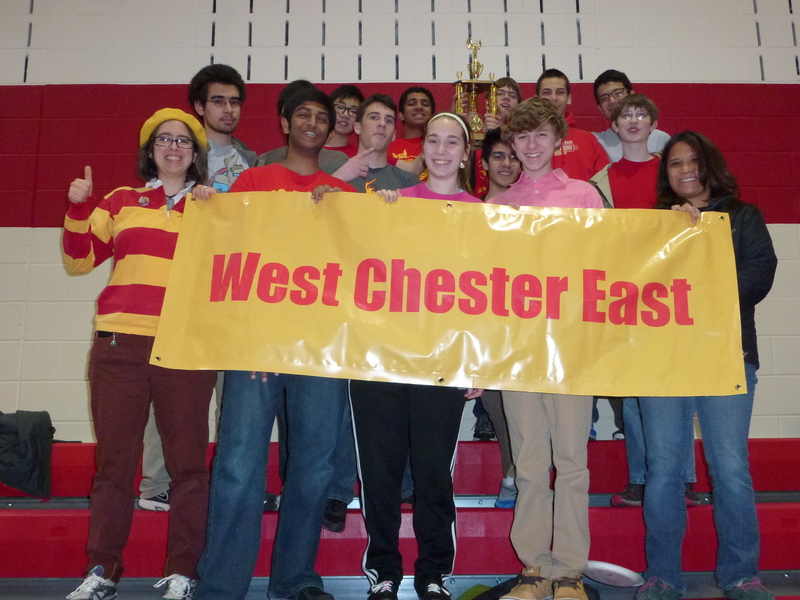 Penncrest has taken home the banner (literally – we have a banner that goes to the winner’s school until the next meet) more times than I can count. 24 Today we were testing more toothpick devices for protecting eggs, for Physics Olympics. 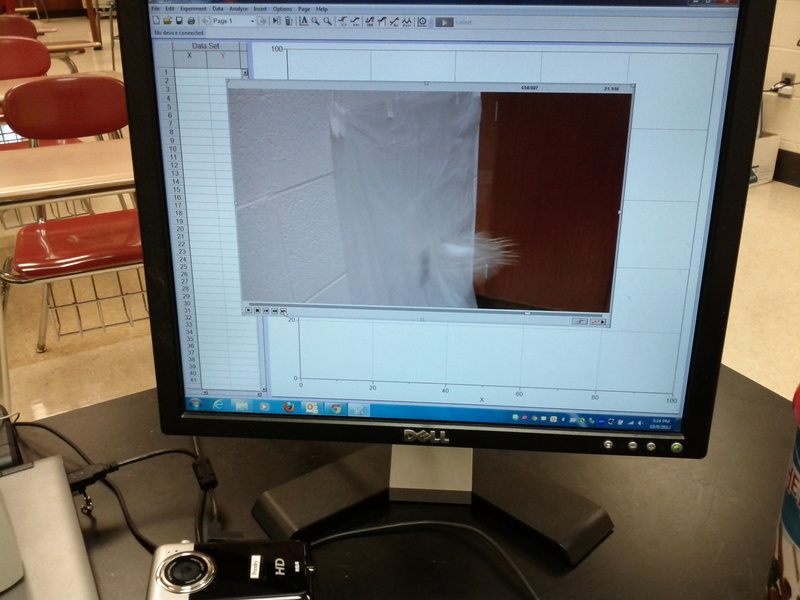 The student who made this one wanted frame-by-frame analysis so he could see how his device hit the wall. So we turned to Logger Pro, of course! 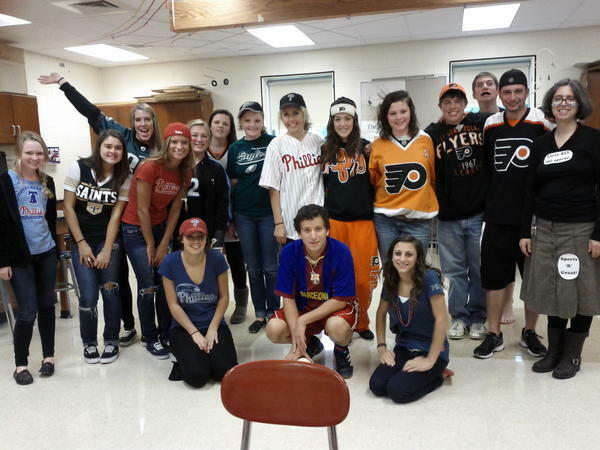 Also, today’s theme was “Crazy Sports Fan Day” and as you can tell we are near Philadelphia. The signs I am wearing proclaim that “I love ALL the sports” and “Sports ‘R’ Great”, plus my face has small “I ❤ sports” messages where people put decorative eye-black. 11 Today our school held an activities fair, in which students had the opportunity to sign up for extracurricular activities, such as the drumming club, the news magazine, Model UN, and Science Competitions. I’m the Science Competitions co-sponsor, and we do Physics Olympics, DOE Science Bowl, the IIT Bridge Building contest, and whatever else kids want to compete in. I’ve been trying to revive our Science Olympiad team, but there doesn’t seem to be much interest. 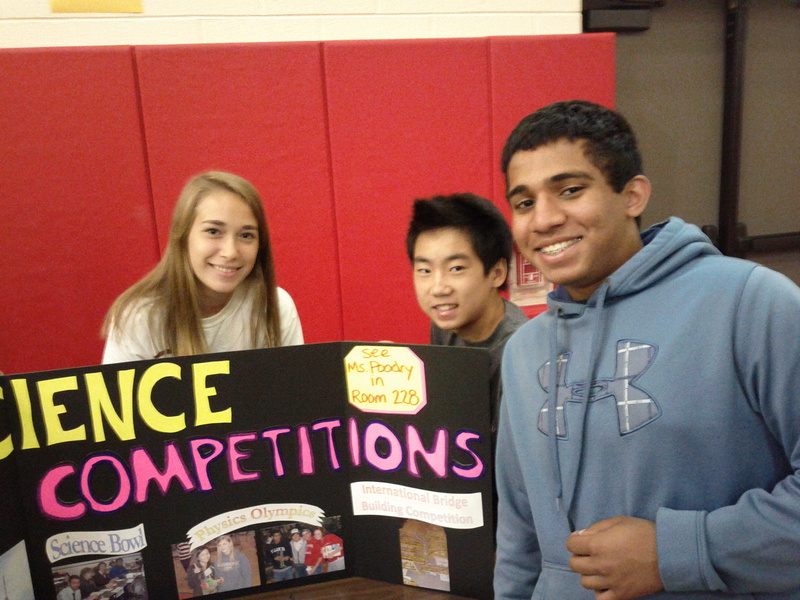 These three kids have been enthusiastic participants, and now they are encouraging more kids to sign up!